Suzuki will show several interesting concept cars at the Tokyo Motor Show which opens to the public on November 23rd. Based on Suzuki's slogan 'Small Cars for a Big Future' the concepts include the iv4 above, which we first saw at the Frankfurt Motor Show earlier this year. This shows what the new Grand Vitara, due in 2015, will look like. While it may be a concept, it's pretty close to a production car in terms of looks. Unlike the current Grand Vitara, the next generation model will be less rugged and more of an SUV. It's actually quite compact and should compete with crossovers like the Nissan Qashqai and smaller models like the new Renault Captur. It will also be available with a next generation ALLGRIP four-wheel drive system. Alongside the iv4 Suzuki is showing the Crosshiker (below), a small crossover that has a hint of Nissan Juke to to it. 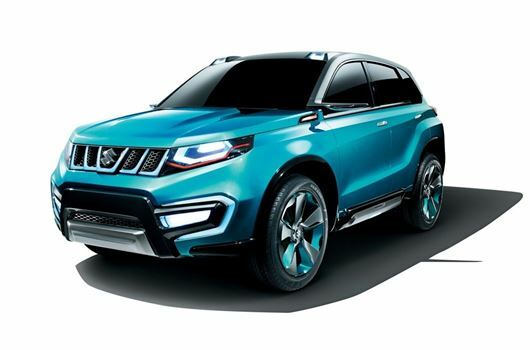 It uses a new platform which will form the base of Suzuki's next compact car but the Crosshiker weighs just 810kg - less than a Volkswagen Up. Power comes from a three-cylinder 1.0-litre engine designed for economy and low emissions. A more unusual concept is the outlandish X-Crawler (below) which is actually based on the ageing Jimny. But in terms of looks it couldn't be any different from the boxy Jimny. The four-wheel drive is powered by a hybrid system which uses a 1.3-litre petrol engine with a new automated manual transmission. Finally Suzuki hasn't let us down when it comes to a funky concept with the brilliantly named Hustler, pictured below. It's reminscent of the Nissan Cube while the front end looks like the original Toyota Land Cruiser. Suzuki describes it as a crossover for people who 'love the nature, love the outdoors, and love sports'. There's even a coupe variant. I hope to buy a cheap one now that they pulled out.